Billy Graham Was Often Wrong — Joe Raiola! 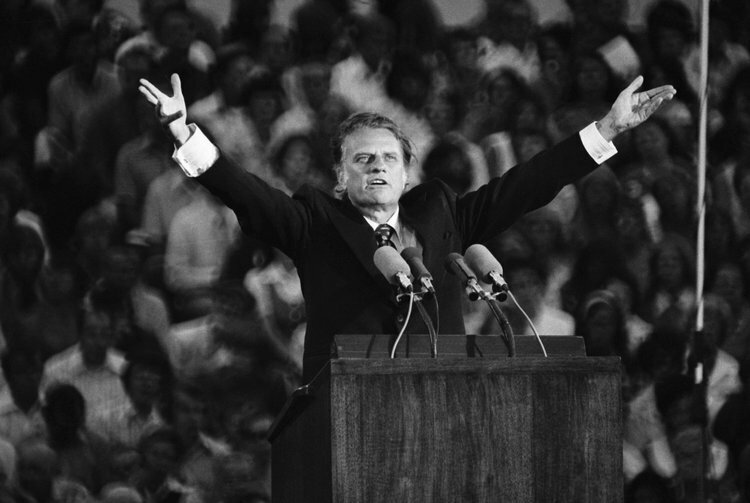 Like most preachers, Billy Graham was frequently incorrect. There is no loophole – unless God exists and He’s an accountant. And even if God exists, theologians are in widespread agreement that the odds of Him being an accountant are exceptionally slim. The Bible mentions antelopes, geckos, maggots, mole rats, serpents, turtle doves and vipers. Sorry, no parrots. Pat Roberston proclaimed that feminism encourages women “to leave their husbands, kill their children, practice witchcraft, destroy capitalism and become lesbians." A “terrific person” wouldn’t say that – at least in public. "Communism is a religion that is inspired, directed and motivated by the Devil himself who has declared war against Almighty God." Communism is not a religion and the devil is not a communist: he's a libertarian. "Only the supernatural love of God through changed lives can solve problems that we face in the world." Nope. In 2015, Stephen Hawking famously published a solution to “black hole information paradox.” He’s an avowed atheist. Obviously, Reverend Graham never sat through Superman v Batman: Dawn of Justice. It is a well-known fact that nothing offends God more than a preacher who claims to know what offends God. That is not only untrue, but breathtakingly shallow. A cross is an archetypal symbol of deep significance. Nailing someone to it turns it into a crucifix, which for many is a major turn-off. “Everybody has a little Watergate in him." These days everyone has a little Deflate-gate in them. That’s terrible advice! Keep your eyes directly on the path in front of you and watch out for precipitous dips. Eternity, whatever that is, will take care of itself without you having to manage it. Who has time for that anyway?